Updated Conference Information will be emailed to all registered delegates by the end of March. When we take students' ultimate concerns as our starting point, the classroom becomes a space where we can explore the metaphysical, ethical, spiritual and philosophical dimensions of being human. What is a good life? What does it mean to be human? How do I find truth? Why is there suffering and evil? Opportunities to address such questions in a philosophically rigorous and existentially authentic way are rare, and yet answers have profound implications for the way we live. 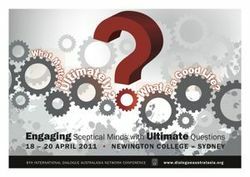 At the 2011 Dialogue Australasia Network Conference, outstanding educators will engage with and model strategies for exploring ultimate questions. Keynote addresses will be followed by Making it Happen in the Classroom sessions, offering practical resources for both primary and secondary teachers of Religious and Philosophical Studies, Values and Ethics. - If you have yet to renew your 2011 DAN Membership or Journal Subscription, please do so before the end of March. The DAN EO will happily email you a copy of your invoice to facilitate payment! 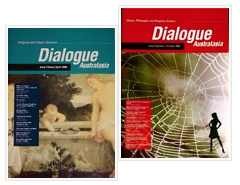 - Gaps in your Dialogue Australasia journal collection? Back issues of most copies are available for $15/each (or $10/each for 4 or more issues) for current & new subscribers. Check out details of past issues and how to order. Matt Damon plays a politician who learns there are forces conspiring to keep him apart from contemporary ballet dancer, Emily Blunt; forces that aren't to be reckoned with and that can erase his life if he doesn't play ball...Matrix-like (but less nuanced and over-expounded), The Adjustment Bureau offers another way into discussions with students exploring free will, predestination, choice, chance, relationships. In reality, do you think we are free to plot our own course through life? What other factors might influence our choices? To what extent do you think these forces control us? Do you think the Chairman was right to take away humanity's free will after it was abused? Why is free will so fundamentally important to us? David assures Thompson, 'I know what I feel for [Elise], and it's not going to change. All I have are the choices that I make, and I choose her come what may.' What do you think of David's choice? Why is this relationship more important to him than his career? David: Why won't they let me be with Elise? Harry: Because she's enough. If you have her, you won't need to fill that void inside of you with applause and votes. The Chairman manipulates David by depriving him of what he loves. Is this how you - or people in general - tend to think of God? Can you trace where these ideas have come from? The Biggest Big Question of All - Why is there something rather than nothing? Michael Shermer proposes at least ten answers to what is arguably the biggest question of all. Asking Islam's Quantum Question - Can science and Islam be reconciled? - interview with Algeria-born astrophysicist Nidhal Guessoum. A wide ranging interview covering the impact of recent and ongoing revolutions across the Arab world for scientific research to historical vs contemporary contributions by Muslim scholars to science. Learning from One Another: Bringing Muslim perspectives into Australian schools is a comprehensive resource from the National Centre of Excellence for Islamic Studies (University of Melbourne). - Strategies, content and learning sequences (primary & secondary) for introducing Islam and Muslim content into the classroom in each curriculum area. - Basic information about Islam and Muslims in Australia and overseas, reflecting the diversity of beliefs, practices, cultures, ethnicities and languages. - Information about Muslims in Australian schools and practical approaches to engaging and including Muslim students. Stuck for a way to help students reflect prayerfully on challenging worldwide events? Or to give new expression to annual events in the liturgical calendar? If so, you might be interested in the Prayers Downunder Website which will be launched in October. It is intended that the site will work on a small subscription fee allowing people to download prayers which are contemporary, fit the lectionary (main celebrations), and which also relate to recent worldwide events. The creators of the site welcome any feedback/ideas you might have about this resource whilst it is still being developed. Examples of prayers include Christchurch Earthquake prayer and God bless Egypt. Life's Big Questions (ABC Compass) Scott Stephens talks to well known Australians about their take on the meaning of life, their beliefs and pivotal experiences. Hear from Masterchef's Matt Preston, The Chaser's Julian Morrow, Lindy Chamberlain, voluntary euthanasia advocate Dr Philip Nitschke, singer songwriter Clare Bowditch and film director Rolf De Heer. Past episodes and transcripts can be accessed online, or watched live at 10pm, Sundays on ABC 1. Islam and Egypt (ABC Spirit of Things) With all eyes on the Arab world (and plenty being written and spoken on the unfolding revolutions), this interview offers two different views. Egyptian-born Muslim feminist and New York-based reporter, Mona Eltahawy is an advocate of the Egyptian revolution and believes it will deliver freedom and democracy. Professor Tariq Ramadan, the grandson of the Egyptian founder of the Muslim Brotherhood, is a proponent of a new Islam that is modern but conservative. Why science can determine human values by Sam Harris (ABC Religion & Ethics Online). Harris defends his claims that morality and values depend on the existence of conscious minds (which can experience various forms of well-being and suffering in this universe). Conscious minds and their states are natural phenomena - fully constrained by the laws of Nature. Therefore, there must be right and wrong answers to questions of morality and values that potentially fall within the purview of science. On this view, some people and cultures will be right (to a greater or lesser degree), and some will be wrong, with respect to what they deem important in life. Looking for a great book to read over the Easter break that offers an illuminating perspective(s) on contemporary practices of Hinduism? Through the different religious paths of nine people, acclaimed historian and travel writer William Dalrymple explores the sacred in modern India. A Jain nun tests her powers of detachment as she watches her best friend ritually starve herself to death. A woman leaves her middle class family in Calcutta and her job in a jute factory, only to find unexpected love and fulfillment living as a tantric in a skull-filled hut in a remote cremation ground. Nine people, nine lives. Each one taking a different religious path, each one an unforgettable story.